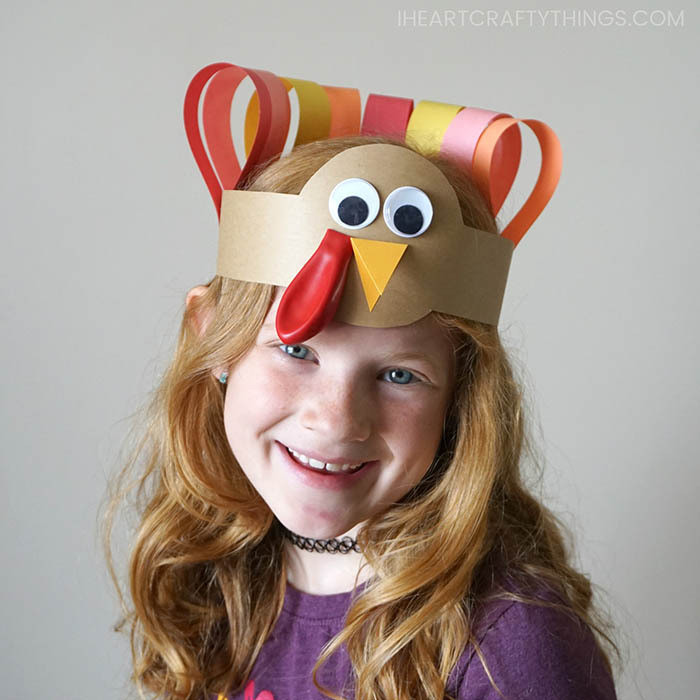 This turkey headband craft is darling and makes a perfect Thanksgiving craft for kids to make during a playdate, family get-together or for a Thanksgiving celebration at school. 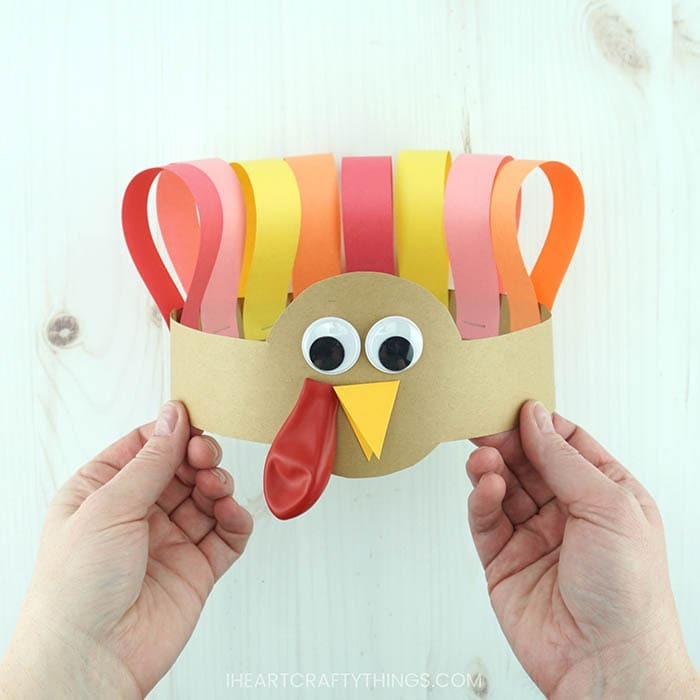 After making the adorable turkey headband kids will have a gobbly good time pretending to be turkeys and giggling with their silly turkey headbands on. 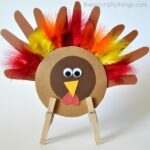 Grab our free template below and get ready for an afternoon full of fun making this cute Thanksgiving craft. turkey headband template <—– Download the Template Here. 1. Begin by downloading the turkey headband template. Print the template out on brown kraft cardstock. There is an additional page of the template with rectangle pieces for the feathers. This page is optional for use. We cut out our own feathers from construction paper. 2. Cut out the two pieces of the turkey headband template. 3. Fold a piece of yellow construction paper or cardstock in half. Cut out a triangle shape along the fold. You end up with a folded diamond shape to use as a turkey beak. Glue the beak down onto the circle face of the turkey head. 4. Grab your red balloon. Depending on how large your balloon is, you might need to trim some of the end off of it so it doesn’t hang down too far off the headband. Use a glue stick or tacky glue to glue the balloon next to the turkey beak. 5. Glue your large googly eyes onto your turkey headband. 6. Use a stapler to staple the back of the turkey headband piece to the front of the headband piece. For younger children you may want to double-check for sizing before adding the final staples. 7. Cut out strips of construction paper 1-inch x 9-inch. We used 8 strips per headband. Fold the paper strips around the back of the headband and staple them in place. 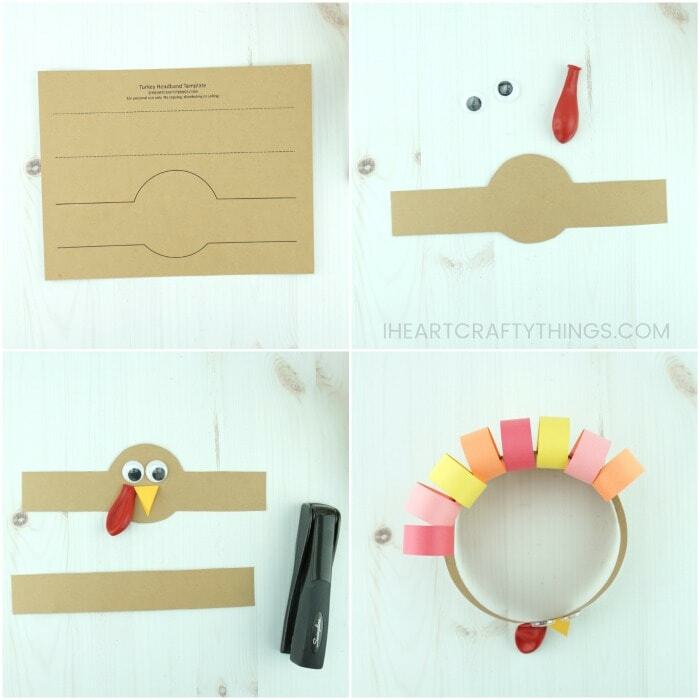 Your DIY turkey headband is complete! 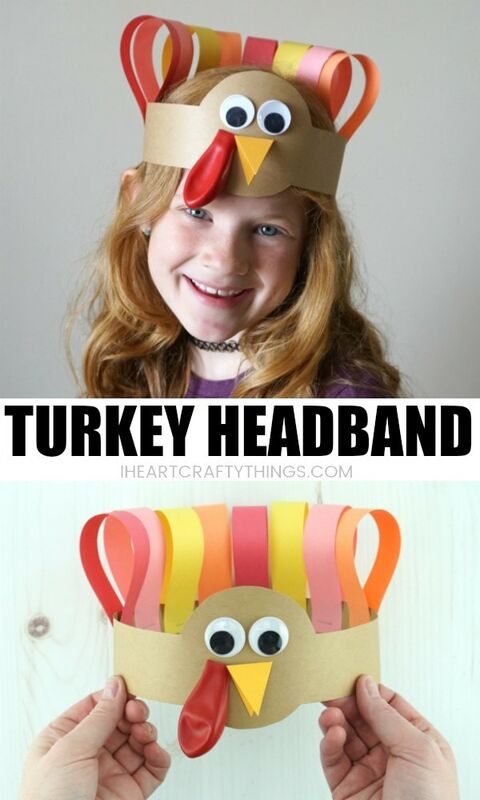 Now children can place the headband on their head and have a gobbly good time pretending to be a turkey, or singing festive songs for Thanksgiving. Do you love crafting with paper plates? 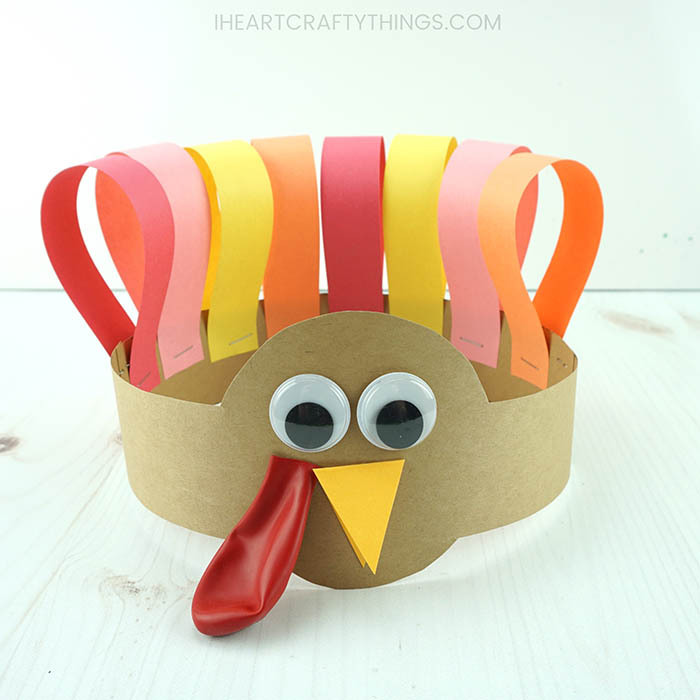 Check out these five awesome paper plate Thanksgiving Crafts. Make one or make them all! 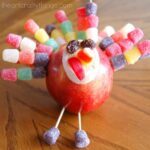 These fun apple turkeys are a favorite tradition for my family. 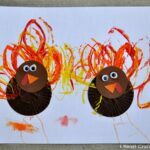 They make a great activity for kids to make at a craft table on Thanksgiving. This cute doily turkey craft is perfect for little ones to make for Thanksgiving. The dot markers make the craft super fun for toddlers and preschoolers.